The family is visiting us here in Umbria and so we are busy getting healthy, delicious meals on the table every day that can be enjoyed by the entire family. Not wanting to spend my day in the kitchen, when It comes to lunches, I love creating healthy salads combining grains, beans and vegetables such as this one. I like my salads to have texture, color, and of course they must be full of flavor. 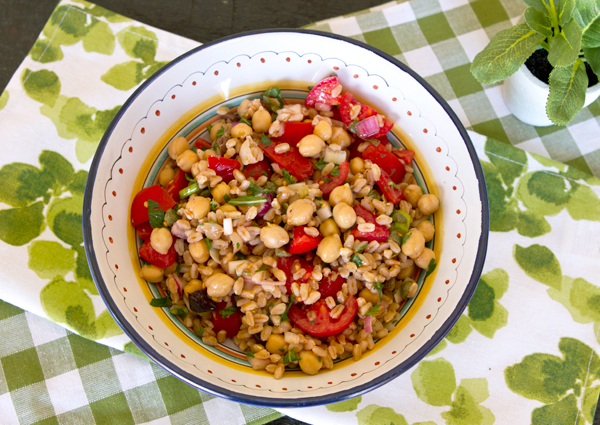 This is an easy salad that can be prepared in under 30 minutes by using farro, canned chickpeas, tomatoes, onions, and fresh herbs. Farro is an easy grain to cook with as it doesn’t require presoaking, though if farro is unavailable you could substitute spelt or barley. In Umbria, farro is a popular grain used in salads, soups, as a grain side dish, or even in place of rice in risotto dishes. It has a slightly nutty taste and if cooked properly should be just tender to the bite. As a complex carbohydrate, farro is rich in the cyanogenic glucosides that stimulate the immune system, regulate blood sugar levels, and lower cholesterol. Though not a complete source of protein, like quinoa, farro contains more than other grains, and also contains lignans that give it antioxidant properties. Whole grains take longer to digest, so they keep you feeling full longer and provide sustained energy. Place the farro in a pot covered by at least two inches of water and bring to a boil. 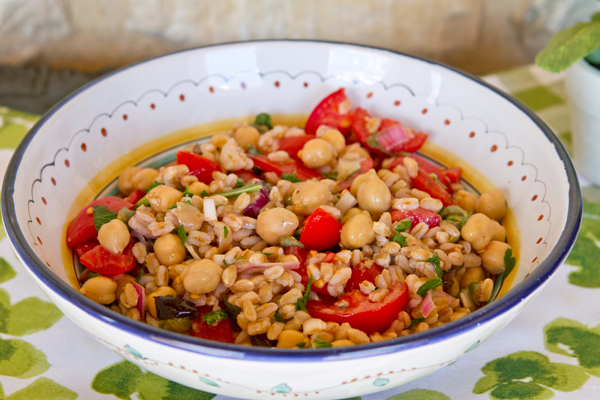 Cook for 25 to 30 minutes or until the farro is just tender to the bite. Drain the farro, cool to room temperature and place in a large bowl. 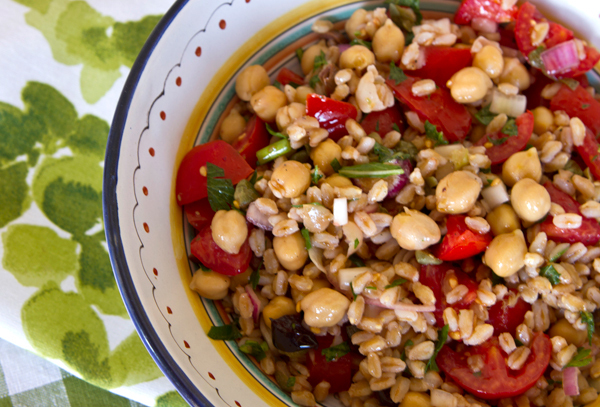 Drain the chickpeas and add to the farro along with the tomatoes, onions, parsley, and basil. In a small bowl, mix together the vinegar, olive oil, salt and pepper. Pour the dressing over the salad and toss to mix well.